Join us in wishing Dustin & Albert HAPPY BIRTHDAY! Dustin celebrated his birthday in July and Albert just celebrated his this week. Both men are in our Foundations Life Recovery Program. Each month we celebrate the birthdays of the men in our residential program – and of course we have cake! Our good friend Stormy bakes birthday cakes each month for our residents! Dustin joined our Foundations program in January of this year. While here he made a profession of Christ in his life and is seeking to make positive changes in his life that will help him once he leaves the program. He is about halfway through the Foundations program so please continue to pray for him in his journey as he grows and faces the challenge of confronting the various things that have caused problems in his life. Albert joined Foundations in September of 2017 after being released into our facility from prison. While in prison he made a profession of Christ which is what lead him to apply to our Foundations program at his release. He wanted a safe, Christian environment to help him grow and change his life patterns and to be in a place where he can build a positive bridge into his future. He quickly joined a local church in Hagerstown and has continued to grow spiritually which has helped him develop great relationships with others. He is very close to graduating from Foundations so continue to keep praying for Albert that he finishes strong and has the confidence to go boldly into his new life without fear. He’s excited about his opportunity to share his new life with others in the community who need to hear about the power of Christ just like he did. Please continue to pray for all of the men who come in and out of our Foundations Life Recovery Program. It’s not easy for guys to acknowledge that they need to join the program and make necessary changes in their lives and it’s even harder for them to continue once they join. These men are facing serious challenges in their lives and they need all the prayer and support possible. Please continue to invest in their lives through prayer, volunteering, and donating to The Hope Center. Your donation of food, used clothing, shoes, housewares, furniture, etc, and your donation of time serving food, hosting a chapel service, painting or doing anything at The Hope Center are all part of helping these men rehabilitate their lives and giving them the recovery and victory they so desperately want and need. Your support truly does make a difference and God uses it to help them move forward in the face of personal issues. Thank you for helping us celebrate these men and their birthdays. To learn more about volunteering or donating to The Hope Center or for more information about our Foundations Life Recovery Program for men please visit http://www.hagerstownhopecenter.com or call 301.739.1165. I don’t know about you but it just seems that each year gets a little shorter and goes by a little faster. 2017 is quickly coming to an end but it literally feels like it just started. It’s definitely been one interesting year. 2017 had it’s ups & downs, good times & bad, high points & low points but with everything going on in our nation and in the world in general, we’ve seen God working and doing things at The Hope Center more than ever. God has been blessing this ministry and He has given us so many wonderful people in the community who have helped us make 2017 one of the best years ever! From hosting another successful Rock the Run 5K in April, to Camp Wild in the summer, The Great Hagerstown Thanksgiving Feast, and all the other activities in between, it truly has been a great year and we’re thankful to each one of you who volunteered, donated, supported, and prayed for us in 2017. But we’re excited and looking forward to all the incredible and amazing things God will do in the upcoming year. And once again we will be hosting our Rock the Run 5K in April except we’ve got a pretty big (and fun) twist on it this year! You and your friends & family will definitely want to be a part of that. And along with our 5K we have so many other activities, events, and opportunities for you to get involved in bringing hope to Hagerstown. And as we’re on the cusp of a brand new year we want to give one final salute to 2017. And there’s no better way to do that than posting pics from all the various things that happened at The Hope Center this year. And if these pics aren’t enough and you just need to see a few more then jump over to http://www.hagerstownhopecenter.com and click on the ‘More’ tab in the upper tool bar. There you can click on the Year In Pictures gallery. Enjoy the look back at 2017! And Happy New Year! We live in a pretty generous area. In fact, the greater Hagerstown region has been so generous and faithful in their support of our ministry that we have never used any government tax money to fund any of our programs or services! Our facilities have remained open and operating 24 hours a day, 7 days a week since 1955 thanks to people in the community who have shopped in our Thrift Stores, donated funds, gave gently used items and kept our pantry fully stocked. So we know all about the great people who give so much to our ministry to make sure others who are less fortunate have what they need to help meet their needs. But every once in a while we are taken aback by the generosity of others. Let us introduce to you a pint-sized hero in our community: Melanie. Melanie may look like just another 7 year old but Melanie did something that most kids would not do for their birthday – she asked her family and friends to donate non-perishable food to The Hope Center. Her birthday request brought in 118 pounds of food for our pantry! Melanie’s parents are helping her understand that there are people in her own community who are in need and struggling with hunger and homelessness. Children are never too young to teach the importance of helping others and giving to the less fortunate. Melanie and her mom were given a tour of the kitchen and dining room where the food will be used to feed those who come for help. Thank you, Melanie, for your generous birthday donation! We are so thankful for your heart to help others and we hope you help to inspire other young people to follow your lead. If you would like to join Melanie in donating food or other items to The Hope Center then call 301.739.1165 or email hagerstownrescue@verizon.net to learn more. If you are in need of assistance then contact us immediately. We’re here to help so give us a call! 2015 is a Year of Celebration! In 1955, God called and a family answered. Jim & Ellen Resh took a leap of faith and followed God into the dark world of homelessness, alcoholism, and hopelessness in the heart of Hagerstown. And now, 60 years later, The Hope Center is standing firm and helping thousands of people each year in Hagerstown. 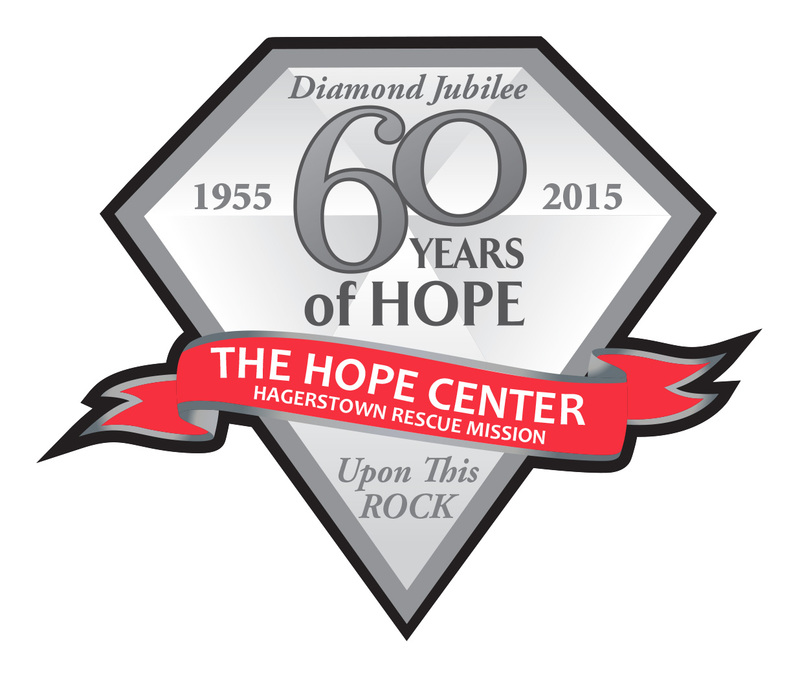 The Hope Center at Hagerstown Rescue Mission is celebrating 60 years of hope this year and it’s going to be a year-long party! We’re hosting events to get everyone in the community involved in our celebration. We have parties lined up, musical shows, dinner concerts, a 5k run/walk, and so much more! To keep up with all the activities, go to http://www.hopecenter60.com and get familiar with our calendar of events for 2015. You can be a part of the celebration by attending, sponsoring, or volunteering at one or all of our activities. We’re beyond excited to celebrate all that God has done at The Hope Center in the past 60 years and we’re thrilled to celebrate with you! You’ve been a part of the impact, now be a part of the party! Check out our 60th Anniversary website, mark your calendars, and spread the word. It’s just not a party without you! Visit http://www.hopecenter60.com to get the scoop on all the anniversary activities. Also, go to http://www.rocktherunhagerstown.com to register to run or walk in our 5k in Hagerstown. To learn about how you can volunteer at The Hope Center, go to http://www.volunteerhagerstown.com. One of our residents, Mark, celebrated his birthday in October, along with our Executive Director, Sonny Shank. Mark has been doing a great job in our Foundations Life Recovery program this time. He’s much more focused and determined to get the victory. He is easy to get along with and causes no problems whatsoever. Yet even here his quietness can harm him if he focuses on outward behavior and not inward transformation. He is proud to profess Christ as his Savior and is currently working hard to honor God with his life. In about seven months Mark will graduate from the program. Today, he has made it farther than the previous two times he was in the program. Pray that he walks out of here a truly changed man who never needs to return for help, but instead may offer help and bring much glory to God. Please pray for Mark as he nears completion of his recovery in our Foundations Life Recovery program. These next few months are important because many men feel that they are as good as can be and leave early only to fall back into the same traps and lifestyles that ruined them in the first place. Pray that Mark will stay focused on God and the goal of total transformation and recovery. And pray that Mark will use his life experiences to help reach others for Christ. He’s truly an amazing man who has a lot to offer. Pray that he allows God to fully use him for His glory. Mark’s festive birthday cake was provided by our good friend, Stormy. Thank you so much Stormy for another delicious cake! 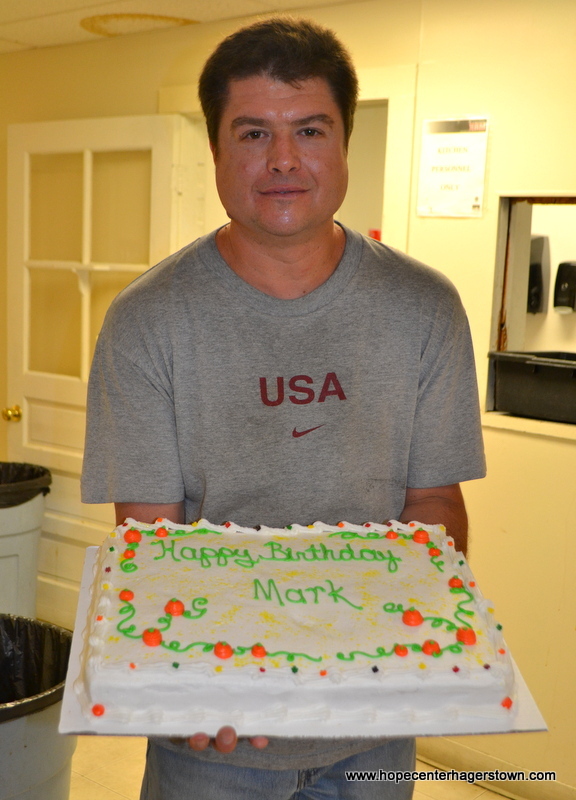 Mark wasn’t the only one celebrating his birthday last month at The Hope Center. Our Executive Director, Sonny Shank, also celebrated his birthday. 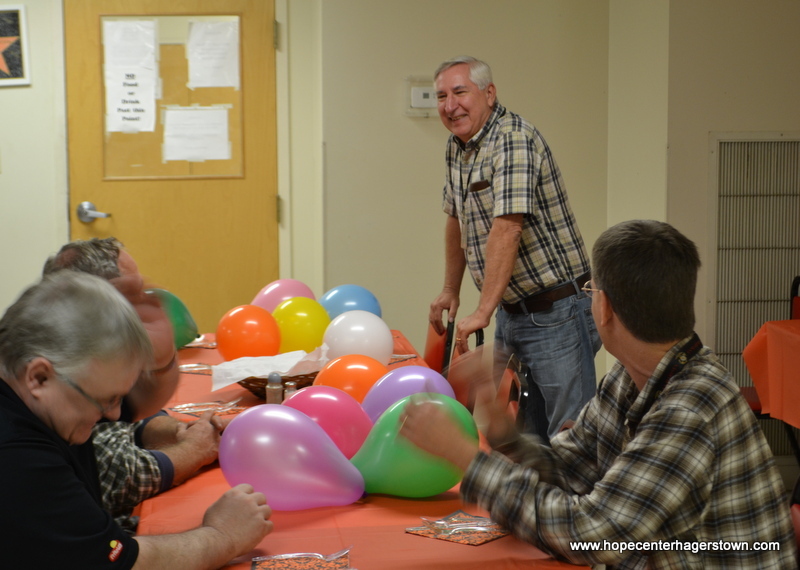 The staff and residents hosted a special birthday lunch for Mr. Shank in the dining room at The Hope Center. Everyone had a great time coming together to celebrate the man that God has chosen to lead this ministry. We’re so thankful for Mr. Shank and all he does for this ministry. Please continue to pray for him as he works tirelessly to lead this ministry.